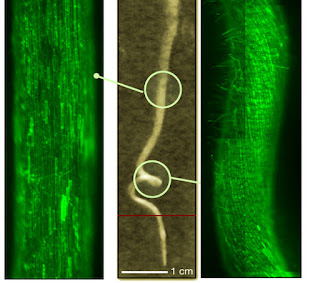 This month on the Physics Buzz podcast I'm talking to two physicists who are both studying plant roots. Last week on the podcast I talked to Cornell physics graduate student Jesse Silverberg about his work studying the way plant roots curl as they make their way through layers of soil. With the booming population of humans consuming more and more food, while taking up more and more space, we're going to need to understand how plants survive (or why they don't) in unusual environments. Look out in the next week or two for the next podcast in this series, where I'll talk with Dr. Dawn Wendell, who is taking a lesson from plant roots and applying it to robots. Many plants live in granular materials, which can include sandy or rocky soils. Plant roots wind their way through these odd locations, looking for the path of least resistance, rather than trying to force their way straight down. Wendell says that robots and mechanical diggers that incorporate this principle of flexibility can save energy and go further than those that are rigid. These diggers might be trying to make their way through rubble at disaster areas, snow after an avalanche, or the sandy soil at the bottom of the ocean. 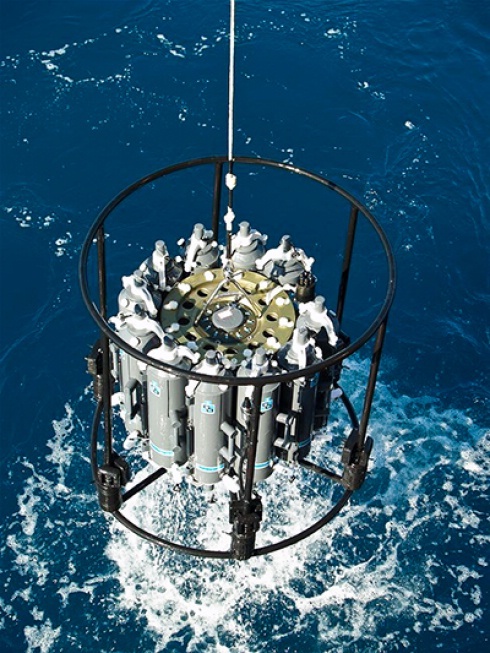 Climate-driven changes in ocean salinity over last 50 years could bring floods and droughts. Ever year, members of the Physics Central team descend on Six Flags America theme park to test the laws of physics and strength of our stomachs (some fared better than others). Meanwhile, thousands of physics students enjoyed roller coaster thrills while learning some physics at our stations around the park. This year, we came armed with accelerometers, an egg drop demo, and several other physics goodies. So strap in, and enjoy the ride. 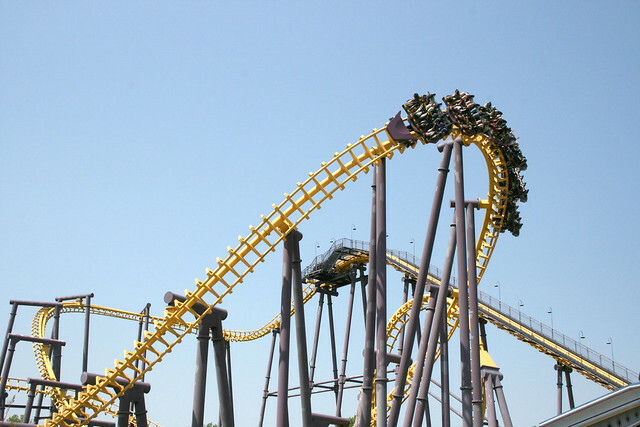 The Batwing roller coaster at Six Flags America. Students on the ride wore special vests to measure their accleration on this and other rides. Image courtesy SPS. Physics fans, rejoice! April 24th is National Physics Day, and physics enthusiasts across the country are celebrating with fun physics demonstrations, public lectures, and other science events. But National Physics Day isn't new; revelers have celebrated physics on or around April 24th for the past 18 years, starting in 1995 at the University of Virginia. 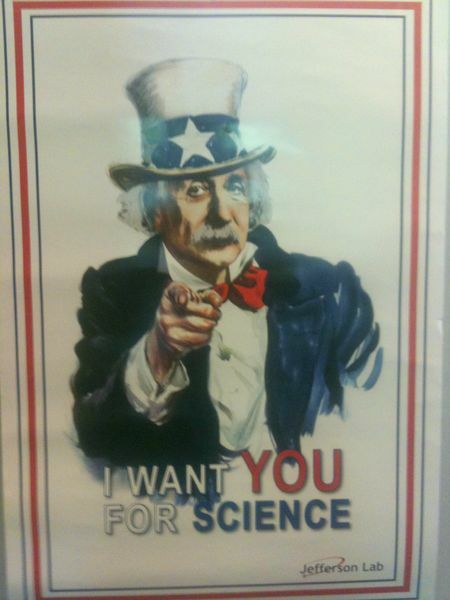 One year later, the National Science Foundation incorporated National Physics Day into their now defunct Science and Technology Week. Despite that program's end, National Physics Day has endured. "It's always been focused on getting young children interested, and they're a fantastic audience," said Craig Dukes, a University of Virginia physicist who helped organize some of the first National Physics Days. And how do you get the kids excited? "The kids always like something that goes boom," said Dukes. Video games have often been targeted by critics as time wasters that distract students from their education. Although video games don't always pair well with educational material, sometimes this pairing can be fantastic. One such example is The Solar System: Explore Your Backyard -- a forthcoming PC/iPad/iphone application that gives you the freedom to explore our solar system in all of its glory. You can travel from planet to planet, get detailed information about planets' moons and orbit, and even visualize many of the sky's constellations. A virtual tour of the solar system application courtesy of Christopher Albeluhn. More than 500 million years ago, during a time known as the Cambrian explosion, novel categories of multicellular life forms appeared in a carnival of biological innovation unmatched in our planet's history. 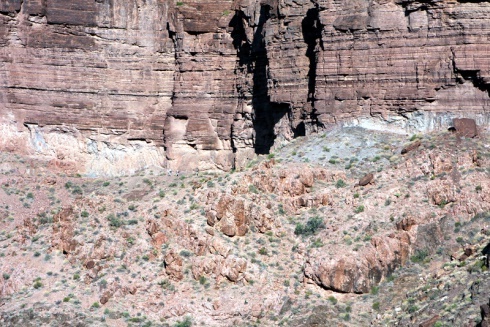 New research ties together this burst with an ancient mystery called the Great Unconformity. 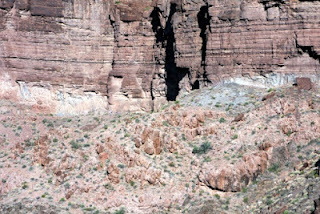 The Great Unconformity refers to the huge gaps left in the planet's rock record where relatively young sedimentary rocks -- still a few hundred million years old -- sit atop much older igneous and metamorphic rocks. For example, in the Grand Canyon, 1.7-billion-year-old metamorphic rock is topped by a layer of sandstone that's about 500 million years old. Similar unconformities exist throughout much of the world, leaving a limited record precisely when life was advancing so quickly. Uncovering historical trends can be a bit of a dark art. But in recent years, engineers and researchers have made it easy for the general public to quickly search through enormous sets of data. Google's Ngram viewer, for instance, allows users to compare word usage since 1800 in its massive digital library of books. Ngram is pretty simple: input some words or phrases that you want to compare (e.g. 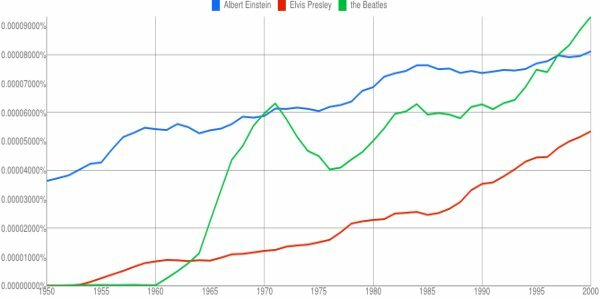 "the Beatles," "Albert Einstein," and "Elvis Presley,"), pick a time range and press enter. Google then outputs a nice looking graph of the relative popularity of these terms in books throughout a given time period. If you haven't already, give it a try! While the Ngram Viewer has been around for over a year, a similar project that tracks trends in scientific papers was recently unveiled. Called bookworm arXiv, this new tool works just like Ngram, but it searches through preprints of academic papers that scientists have posted on arXiv.org. Now it's much easier for anyone to search for the hottest research trends with a few keystrokes and mouse clicks. As Olympic fever has started to build for the 2012 Summer Games in London, a physicist has analyzed a peculiar aspect of 400 meter and 800 meter track races. For the vast majority of world records in these races, the runner runs the first half of the race faster than the second -- a positive split. These consistent positive splits don't happen for shorter races (the runners tend to run faster during the second half) or for longer races (world records don't seem to favor either positive or negative splits). So Jim Reardon, a physicist at the University of Wisconsin Madison and a track coach, decided to uncover the reason using physics. The end of a women's 100m race. Image Courtesy Beat via Wikimedia Commons. 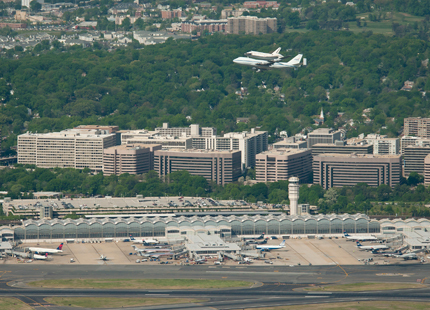 Space shuttle Discovery, mounted atop a NASA 747 Shuttle Carrier Aircraft (SCA), makes its way past Ronald Reagan Washington National Airport on April 17 in Arlington, Va. Photo credit: NASA/Bill Ingalls. 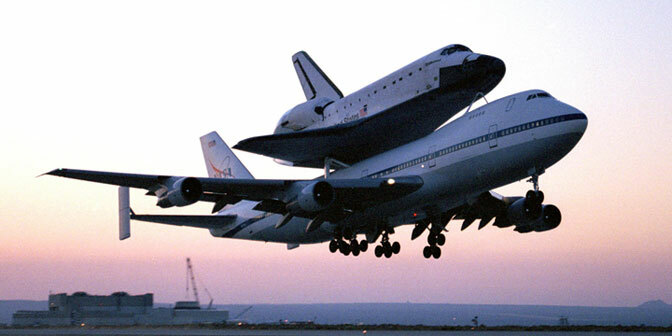 Yesterday the shuttle 'Discovery' flew from Florida to DC where it will be put on permanent display at the Air and Space Museum. No, you will not be able to crawl through it and pretend you are an astronaut, but yes you will be able to see an amazing piece of US space flight history. Members of the Physics Buzz team were lucky enough to watch the flight at the NASA Goddard Space Center. Views may have been better downtown, but seeing the fly-over with a huge crowd of NASA scientists and their space-enthusiat family and friends was quite an experience. One employee's children even brought their stuffed shuttles. Here is a video of this great event. 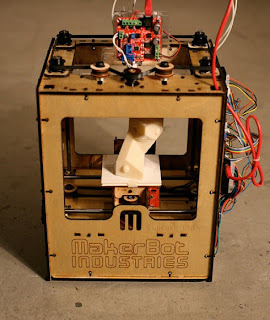 Will 3-D Printing Launch A New Industrial Revolution? Peter Schmitt, an MIT doctoral student, printed a clock in 2009. He didn't print an image of a clock on a piece of paper. He printed a three-dimensional clock -- an eight-inch diameter plastic timekeeping device with moving gears, hands and counterweights. When he put it up on a wall and pushed the counterweight, it went ticktock. "It wasn't very accurate, but it was a functioning clock," Schmitt said. MIT scientists also would like you to be able to print your own robot. Their vision: Decide what you want it to do, download the design from the Internet, use software to make whatever changes you want and hit "print." Earlier this week, a careers website released a fairly comprehensive ranking of 200 jobs from best to worst. Using data from the Bureau of Labor Statistics and other government agencies, CareerCast.com's team evaluated jobs based on factors including stress, income, employment outlook and physical demands. Don't worry physics fans; "physicist" ranked pretty highly on the list at 25, ahead of "biologist," (27) "historian," (30) and "taxi driver" (187), to name a few. Newspaper reporters -- perhaps the most similar job to science communication on the list -- ranked very poorly at 196, squeezed between waitresses/waiters and oil rig workers. Looking at the list, there's definitely a few surprises. Firefighting, the aspiration of many wide-eyed kids, was ranked near the bottom of the heap at 185. Many other jobs were ranked more highly than many would have guessed, and that makes me question how accurately quantified data can represent job satisfaction. "Can't get enough of your (non-newtonian) love, babe..."
Most of the time when you think of a fluid you think of water or soda or if you are like me this evening, beer. Some more creative people may say "aha! air is a fluid!' which it is. Fluids like these examples move the in the same way no matter if you push them fast or slow. But there is a whole other class of fluids, non-newtonian fluids, that flow in different ways depending on how you make them move. A few days ago an assortment of slimes and silly putties ended up on my desk and included in that assortment was Jupiter Juice. This stuff is nothing short of awesome. It is also non-newtonian. So what was the first thing we did? Put it on a speaker and play it some Barry White. Here's a practical application for your physics education: using math to successfully beat a traffic ticket in court. Dmitri Krioukov, a physicist based at the University of California San Diego, did just that to avoid paying a fee for (purportedly) running a stop sign. "A way to fight your traffic tickets. The paper was awarded a special prize of $400 that the author did not have to pay to the state of California." Max the Dog is quite the adventurer. As the protagonist of the critically-acclaimed children's book series bearing his name, Max has traveled to a number of galactic locales including the Moon, Jupiter and Mars. But there's one place he hasn't appeared until now: the big screen. Thanks to a team of undergraduate students and staff at the University of Colorado Boulder, audiences can follow Max's trip to the moon with an adapted planetarium show. Earlier this week, a part of the Physics Central team went to the nearby NASA Goddard Space Flight Center to take a journey through space. Our intrepid photojournalist, Quantum, took plenty of great pictures as we toured the visitor center and the portable, inflatable Geodome planetarium. Space cadet Halfstache prepares for liftoff. At this year's April Meeting, scientists have been discussing the U.S.'s future role in the physics community in light of a recent burst in physics collaborations around the world. Some are particularly worried about the U.S.'s role in particle physics after Fermilab's Tevatron was shut down last year and eclipsed by the early physics research at the LHC. But, at the same time, other experts contend that we've achieved just what we wanted all along -- a stronger international scientific community. An image of Fermilab with the Tevatron in the background. 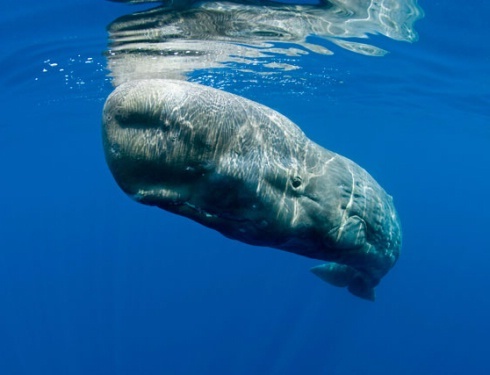 Image courtesy DOE. Here at the 2012 April Meeting, we're celebrating the 100th anniversary of the discovery of cosmic rays by Victor Hess. Also, the meeting is taking place just months after the 100th anniversary of the first successful expedition to the south pole. Nowadays, the south pole and particle physics are intimately intertwined, and one physics outreach specialist attending this meeting has demonstrated his efforts to popularize fundamental frigid research at the IceCube Neutrino Observatory. Astrophysicists at the 2012 April meeting of the American Physical Society have presented images of black holes at unprecedented levels of detail. The Milky Way black hole as seen by the LIPRA1 antenna array. Courtesy of Brian Jacobsmeyer III, LIPRA1 collaboration. LIPRA1 (Large Intensifying Photon Resolving Array), a test bed for the forthcoming LIPRA2 array in the Atacama Desert of South America is already returning startling images of a number of black holes, including the Galactic Black Hole at the center of the Milky Way.